Cranshaw is currently constructing a new building and renovating one of the historic buildings to create mixed income housing. The 1.5 acre site is part of the 8.3 acre Brighton Marine campus and is located on Commonwealth Avenue. The existing site included four, two-story buildings (buildings 3, 4, 6, and 7). Buildings 4 and 7 will be demolished, and Cranshaw will relocate Building 6 elsewhere on the Brighton Marine campus to accommodate the new six-story, 111,650 square-foot multi-family residential building. The new L-shaped building will include a mix of studios, one, two, and three bedroom units. Building 3 will be renovated to include 1,450 square-feet of residential space and 1,110 square-feet of common amenity space. 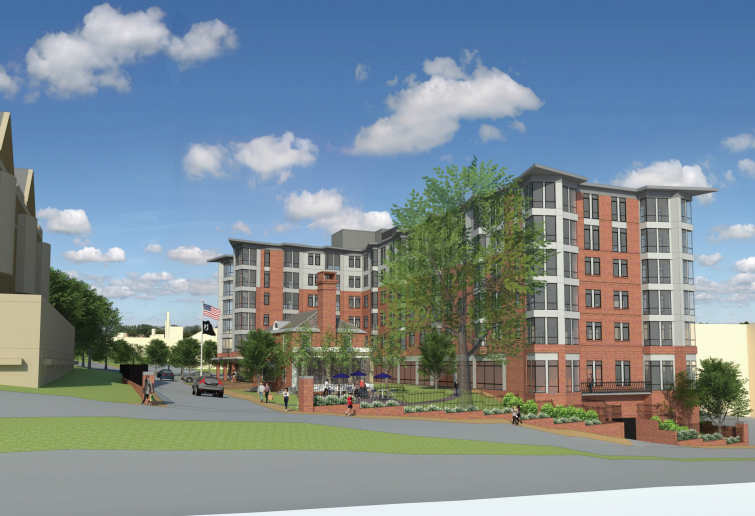 In all, there will be approximately 101 residential units (86 affordable) with preference given to veterans in keeping with Brighton Marine’s mission. The project will also include a below grade parking garage with approximately 49 parking spaces as well as approximately 52 additional surface parking spaces and 101 spaces for bike storage.